Who can apply for a Spain visa in the UK? How to apply a Spain visa from the UK? Spain is considered as one of the most attractive countries to visit in Europe. Although UK citizens who hold either a full UK passport or a BOTC, BOC, BPP or BS passport can travel freely to Spain, UK residents of many specific nationalities are required to get a Spanish Schengen visa to travel to Spain. In recent years, following visa liberalization policies for non-EU countries, the number of countries whose nationals require visas to travel to Europe has slightly decreased. Here is the list of nationalities that are still required to get a Schengen Visa to visit Spain and other Schengen states. Stat: As per 2016, Spain has issued a total of 1,424,761 uniform Schengen visas from 1,583,848 applications received. Below you can find more information about the requirements and guidelines on how to apply for a visa to Spain from the UK. Citizens of these countries residing in the UK and planning to visit Spain are required to get a Spanish visa in order to be able to enter Spain. The main requirement is that you must have a UK residence permit valid for at least another three more months beyond the date you plan to leave Spain / the Schengen Area. Use the Spanish Schengen visa eligibility checker tool to find out if you qualify to apply for a Spanish visa from the UK. If you have a 3 month UK visa you can extend it for three more months in order to be eligible to apply for a Spanish Schengen visa from within the UK. You must apply for an extension before your visa expires and while you’re still in the UK. Find out more on how to extend your UK visa. In case you plan on staying in Spain for more than 90 days you must apply for a residency permit, not a Spain Schengen visa. Please note that if you are not a resident in the United Kingdom you should apply at the Spanish Embassy/Consulate or Spanish visa application center in your home country. 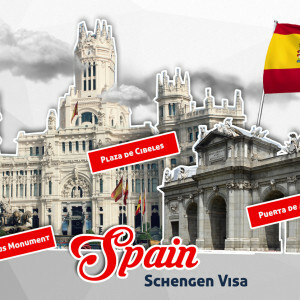 What documents are required when applying for a Spanish Schengen visa in UK? Your passport will be valid for at least three (3) months after the date you exit Spain. A valid UK residency permit or other form of Identity Card. The UK residency permit must be endorsed in the actual passport (or on a new biometric ID card). Note: You cannot book an appointment if you have minor injuries on your fingers. You have to wait until the injuries have healed in order to book an appointment. One application form filled out completely and signed by the applicant (please read the explanations carefully). You can also apply via 3rd party websites like this one here. You have to pay an extra fee for their services, but they will also help you with Appointment booking, Documents checking, Visa application as well as with Visa and Passport collection. For more information, please click here! One passport format photo that has a light background, is rightly coloured, and shows full face features. The photo must be less than three months old and be glued on the application form. Applications with stapled photographs will be rejected. Printed tickets or email confirmation from the carrier company. Learn how to get flight reservation for visa. Travel Insurance stating that you are covered in case of a medical emergency and repatriation all over the Schengen area and not just in Spain (minimum coverage of € 30.000). Proof of financial subsistence : A recent statement of UK bank account for the last three months that shows funds of at least 500 £ (594 €). For stays longer than 8 days the daily required amount is 55 £ (65 €) for each day beyond the 8th day. Note: Cash is not accepted as a valid proof of financial subsistence. Invitation Letter – A visa invitation letter is a letter written by the person / company you are going to visit in Spain. The documents listed above are documents required in all cases, regardless of the purpose of your visit in Spain. Underage children must be accompanied by parents or a an adult guardian at the application center at the Spain Consulate General. Also, minors who are granted a Spain visa are not allowed to travel to Spain by themselves. They should be accompanied by an adult during their stay in Spain. Note: All documents must be either in Spanish or English or officially translated by a certified translator. The application procedure for a Spanish visa in UK is pretty similar to that in every other country in the world. Figure out which Spanish short-stay visa type you need. There are different Spanish Schengen visa types depending on your purpose of traveling from UK to Spain. Find out where you need to apply for a Spanish visa in UK. Decide when to apply for a Spanish visa in UK. The earliest time you can lodge your Spanish visa application in UK is 3 months before your planned trip while, the latest time to is at least 15 working days before you intend to travel from UK to Spain. Collect the mandatory Spanish visa documents for UK Residents. Appoint an interview at Spanish visa application center in UK. You may make a Spanish visa appointment online, through phone, or on person. Below in this article, you can find more information on how to make a Spanish visa appointment. Attend the interview on the day of your appointment. Show up on time and try not to be nervous. Remember that the interview is a crucial part of your visa application. Pay the Spanish visa fee. Wait for the processing of your Spanish visa. To apply for a visa to Spain in the UK you must book an appointment with the Spanish Consulate in London or Edinburgh based on your county of residence. By booking a visa appointment directly with the at the Spanish Consulate. All applicants who want to apply directly should write a letter, which can be delivered in person or by post, to the Spanish Consulate. An appointment will usually be given within 2 weeks after you apply if there are appointment slots available. The Consulate works Monday to Friday from 09:15 AM to 2:30 PM except on holidays. Through the Spain Visa Application Centre in London operated by BLS International. Through IAM website by filling an online form. IAM’s visa advisors will contact you as soon as possible to confirm the suitable date and time for you to attend the Spanish visa processing center in the UK (London, Edinburgh or Manchester). They will fill in an Application Form for Spanish Schengen visas online to secure your appointment and send it to you together with a complete list of requested documents and the confirmation of your appointment. The IAM’s team will assist you in collecting the required documents and checking your prepared application to make sure your spanish visa application has the highest possible prospect of success. For more information on applying for a Spanish visa in the UK, click here or start the Spanish visa application by filling the online form here! Depending on your reasons for visiting Spain and the frequency of your visits, the Spanish consulate in London can issue you a single-entry visa, double-entry visa, or a multiple-entry visa. You can only apply for a Spain visa within three months before your planned trip. The processing time of your application may take from one to four weeks from the day you submit your application, therefore you are advised to apply earlier. For your convenience, you are advised to apply for a Spanish visa at least 20 working days in advance. Visas are not issued on the same day except in cases of extreme medical emergency. You will be required to bring a document of proof for your medical emergency. Keep in mind that these fees may change depending on currency fluctuations and can only be paid in UK Pounds and payment must be made in cash. Also, visa application fee is not refundable and doesn’t guarantee that you will be granted a visa to Spain. Besides children younger than 6 years of age, the spouse of an EEA/EU national is exempted from a visa application fee. Does a non-EU spouse of a UK national need a visa to Spain? Otherwise, you are required to obtain a visa to Spain. Can Indian passport holder apply for a Spanish visa from UK? Indian citizens and Indian passport holders that have been legally residing in the United Kingdom for more than three months can apply for a Spanish visa in the UK. Non-residents such as Indian travelers and Indian tourists who plan on staying in the UK for three months or less should be discouraged from applying for a Spanish visa from UK. Instead, they should apply for a Spanish visa in India. What can I do if my visa gets denied? A copy of the refusal letter. Who can be accompanied inside the Spanish visa application centre? Children under the age of 18 and applicants in need of assistance due to disabilities or health problems can be accompanied inside the Spanish visa application center. Can I book one appointment for all my family members? For each member of you family, including children, you must book an individual appointment. If you have questions or need a professional help on filling the Spanish visa application, check IAM (Immigration and Migration) website. How long can UK residents stay in Spain without a visa? Unlike UK citizens who can stay in Spain for as much as their passport is valid, UK residents can only do so to 90 days. If you are a UK resident who wants to stay in Spain for more than 90 days then you should apply for a EU residency permit in Spain through the Consulate of Spain in the UK. Do I need a passport if I am traveling from the UK to Spain? As an EU citizen: You will not need a passport to travel from the UK to Spain. Instead, you must hold a valid EU national ID card to confirm your identity and nationality when entering Spain. As a non-EU citizen: You must have a passport and you might also need a Spanish visa to travel to Spain from the UK. Passport must not be older than ten years. They must hold a validity period of at least three months since the day you will be leaving Spain. At which Spanish Consulate General should I apply? Spain is represented in the UK through two Consulate Generals: London and Edinburgh and three honorary vice consulates: Birmingham, Cayman Islands and Bermuda. However, for visa applications the whole UK territory falls under the jurisdiction of two Consulate Generals. To choose where to apply for a Spanish visa in the UK you should consider the country you are resident in. You can apply for a Spanish visa at the General Consulate of Spain in London, if you are a UK resident living in any of the countries or overseas territories falling under the consular jurisdiction of the Spanish Consulate in London. If you hold a diplomatic, service or official passport. The following English counties: Cleveland, Cumbria, Durham, Cheshire, Greater Manchester, Lancashire, Merseyside, North Yorkshire, Northumberland, Tyne & Wear, West Yorkshire. Note: Honorary vice consulates in Bermuda, Birmingham and Cayman Islands do not handle visa applications. If you need help on filling your Spanish visa application, making an appointment for you at Spanish visa application center in London, Edinburgh or Manchester, IAM’s visa advisors might help you at any time. For more information, please click here or start the Spanish visa application by filling the online form here!